Ep 25 | Business Success With Ready, Fire, AIM! 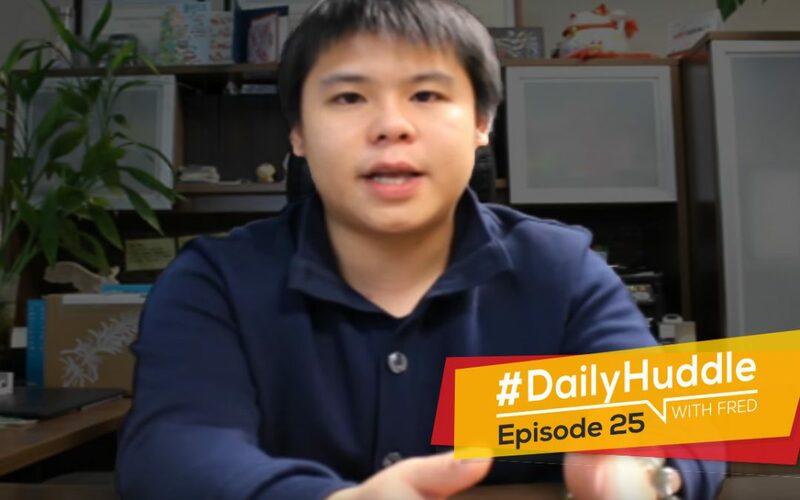 Welcome to our daily huddle episode 25. Obviously, today I came in around 10 minutes late than I normally come in which is at around 6PM Pacific time and 9PM Eastern so I apologize for the slight delay. For those of you who are first time joining us in our daily huddle, the daily huddle is all about basically me answering five burning questions that you may have for your business or basically you’re stuck in life and you want me to help you out based on my experience. All you need to do is simply go to www.fredlam.com/ask put in your question in there and I will get it featured in our daily huddle. I actually come on live everyday from Monday to Friday at around 6PM Pacific, 9PM Eastern and sometimes I may have to do it earlier or later depending on my schedule. Tomorrow is Wednesday and obviously I have a lot of webinars that I’m going to run so I will come in early than my normal expected time. As you can see in today’s topic, I’m talking about ready, fire, aim! I’m going to explain to you what this is based on one of the questions asked by one of my followers and I’m going to elaborate on that a little bit further. It’s actually super critical for you if you’re starting out of your business. Before I get into our daily huddle I want to make a quick announcement. Yesterday, I did a raffle for a trip to Vancouver for free and have a one on one consultation day with me. I actually set a date and that person with order ID ACLZBNQR has only 24 hours to reach out to my team to confirm if he is the actual winner or not. It has passed 24-hour mark; however, we did receive and email from one of the persons who signed up for Rich Dad Summit. He did submit to us a receipt but we weren’t able to open the attachment so I have to wait until tomorrow to see if that person responds with his actual receipt and if it’s him then obviously that trip is going to be given away. If tomorrow, by any chance that he actually gave us the order receipt and the number didn’t match up, I will do the raffle again and see who that next person is going to be. Now, instead of me finding out who owns that order ID, I want you to take control and be here with us every day if you want to really win an amazing prize like a trip to Vancouver and meet me in person. If that person who owns that order receipt ID don’t get back to me by tomorrow, we will redraw and see who that next person is going to be to win that free trip to Vancouver where I pay for your flight and your hotel and we will have a one on one consultation day to talk about your business. Put in the word EXCITED into the comment box if you guys are excited about that. Obviously, this is very rare that I actually do this all the time. I’m doing this only because it’s Christmas and obviously I want to inspire someone and to get you guys to attend the Rich Dad Summit. [0:04:15] Question 1: I'm a very, very beginner. Love your content on Youtube. My main issue that I'm a perfectionist and am STUCK on the name of my website and logo creation.....That's hilarious I know, but this is like fundamentals that stop me from moving further with setting up and starting drop shipping ecommerce. HI Fred, I’m a very, very beginner. Love your content on Youtube. My main issue that I’m a perfectionist and am STUCK on the name of my website and logo creation…..That’s hilarious I know, but this is like fundamentals that stop me from moving further with setting up and starting drop shipping e-commerce. This is the exact thing that actually inspired me to talk about today’s topic and I want to share that with you Leana about ready, fire, aim! Here’s the truth, I know you’re a perfectionist but at the end of the day you are absolutely wasting time. I hate to say that to you but that’s the truth you are absolutely wasting time right now. The truth is when you’re creating your first store this may not be the store that you are going to actually build a legacy business of or you are basically using this business forever and ever. That is the truth. I went through several e-commerce niches before I identified what I love and before I actually scaled it to the multi-million dollar level. For you, listen this is going to be true, I’ll be lying to you if I’m making this up. You would absolutely need to start getting your feet wet first. 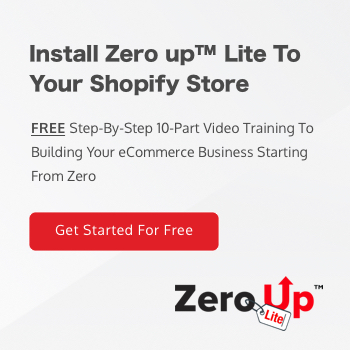 Worry about the name later, worry about the logo later because you want to go through the process of basically how you create your first e-commerce drop shipping site. You don’t want to basically get stuck on something that is so simple. What I would ask you to do is go with what your gut is telling you from day one. If you’re gut is telling you that you are going into a certain niche with a certain name, go for it. Don’t have second thoughts in there because we only have a five-second rule. In five seconds, if we don’t make a decision our second mind kicks in and will start basically finding excuses, finding other things that actually make you not moving forward. Again, my super important word of advice for you is ready, fire, aim. And this book is actually written by someone named Michael Masterson. This is the second book that I actually read fully. First book was the Cashflow Quadrant by Robert Kiyosaki. The second book that I’ve read from start to finish was the Ready, Fire, Aim. It really changed my perspective of running a business because the reality is that if you look at any large companies, any businesses they do not perfect their business model. They do not perfect everything when they start going out into the market. Let’s look at YouTube. When YouTube first came out it was a huge failure. It was not successful but they were basically going at it. They were taking action. They weren’t perfecting it yet. And even when Google decided to buy YouTube, they were still not in perfection. Right now YouTube is still not in perfection, they are still constantly working on, building on top of it and constantly changing things like interface, how videos are ranked and basically compliance and all those other stuff because in our world now a days, in such a dynamic world there is nothing that says it is basically perfect. This is step 1, step 2, step 3 this is exactly what you need to do. you’re not working at a McDonald’s where basically this is how you make a Big Mc. Step 1 get a buns, step 2 put in the sauce, step 3 put in the patty, put in the middle buns etc. We’re not a fast food chain. You are building your own business and each business yes, you would need to know what your angles and you would need to know what your vision is but through the process of going from point A to point B is going to be different. What you experienced in the middle is going to be different so at the end of the day if you try to perfect it it’s going to be wasting yourself a lot of time. There may be a scenario that will come up where your current niche that you are thinking that you’re going after right now doesn’t turn out to be profitable for you. And guess what? All the time that you’re trying to perfect your name and logo is going to basically waste a lot of time for you. If you look at even Coca-Cola they have changed their logo so many times because again, that’s how people get ready, they get things ready, they start it first and then they perfect that later. It’s very important for you to understand that. This is what you need to do in order for you to actually be successful in business because if you keep consistently perfecting things, you are wasting a lot of time. And as a matter of fact you don’t even know if that’s going to work or not. What you have to focus on is getting the knowledge and finding the products that are going to actually produce results for you and your business. Lean, word of advice if you are basically saying the perfectionist side of you kicked in, remember this three words; ready, fire, aim because the most important thing when it comes to business is to basically keep taking action, keep taking steps and move forward. [0:10:22] Question 2: My question goes like this is it possible for someone to run an ecommerce store in USA and Canada without physical living there if so what are the requirements? The second question is by Uchime Augustine. 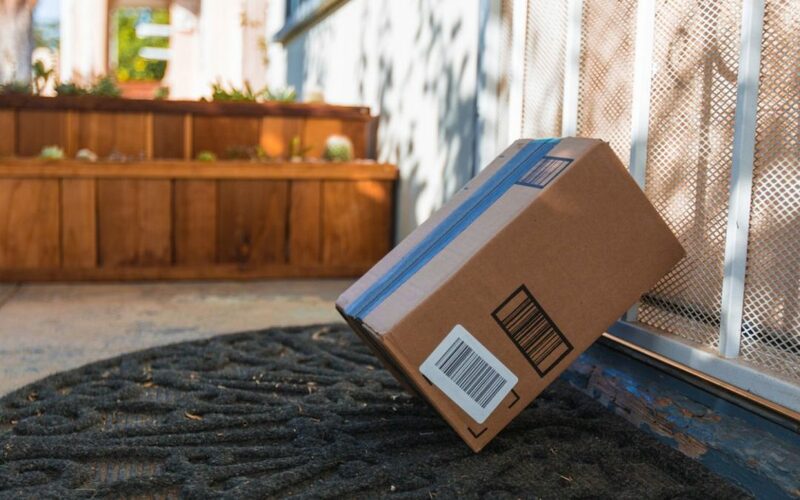 My question goes like this is it possible for someone to run an ecommerce store in USA and Canada without physical living there if so what are the requirements? Thank you and stay blessed. 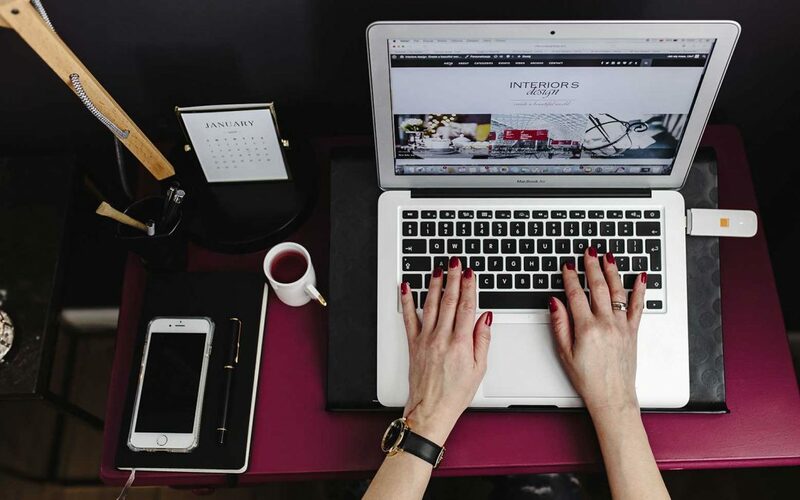 Here’s the beauty when it comes to an ecommerce business and in the golden era of entrepreneurship, is that with the internet you can be anywhere around the world and still be selling anywhere around the world. It doesn’t matter if you are in South Africa, Russia, UK, Ireland as long as you have internet access you are immediately having global access to the entire world of customers. Basically that’s what’s given to you right now; we are living at the perfect time and a perfect opportunity in our day and age to actually create a business. If you look back 10 years ago you don’t have such an opportunity to open the door, bam, right away the entire world is at your disposal where you can actually get access to. Obviously there are things that you need to think about like tax treaty and all those other things. Each country works very differently; they have their own jurisdiction. I can share from my perspective in Canada; I can actually sell whatever into US. I don’t have to have a physical presence in the US as long as I pay my taxes then I’m going to be fine to the Canadian government. That’s what it is and that’s how things are being set up. In UK, again you can actually sell internationally as long as you pay for taxes of your business within your country that is absolutely fine. You may want to seek legal advice and accounting advice just to verify that because each country is very different. Based on what I know and knowledge it is basically a free trade world and you can basically be wherever you want and sell it to markets like US and Canada at the same time. But again, I’m not a legal or accounting expert, I’m only sharing with based on my experience and what I know. It is wise for you to seek local consultants to help you verify these things. The truth is you are living in the world of global access when it comes to entrepreneurship in the online space right now especially on ecommerce. You can sell wherever you want to basically. [0:13:20] Question 3: what are your thoughts on using Instagram influencers are if you do use them, what type are you looking for? I know you use Facebook ads mainly and I haven’t heard you talk much about Instagram influencers. So my question is: what are your thoughts on using Instagram influencers are if you do use them, what type are you looking for? Absolutely great question. I am not super hands on into Instagram influencers. I’ll be honest and upfront with you, I rarely buy influencers. The reason why is that I’m not an expert at it. However, in our company we have our brand ambassador Connor James and I’m pretty sure a lot of you guys heard of this kid. He is a 23 year year old super brilliant kid and he was able to figure out Instagram influencer in a way where it blew me away. I’ve been advertising millions of dollars online; obliviously I know a lot of things. I know how Instagram influencers work but at the end of the day I have someone who is better than I am and he is Connor James. He basically has a specific algorithm in placed to calculate based on what you need to look at in order for you to figure out if that influencer is a bot or id it’s a real person who will actually perform results to you. With that Connor actually launched something called the influencer master class. We had a workshop together somewhere on the internet, I have to find the link and I can share that to you guys. To really learn about influencer, we did a workshop together. It blew me away because he actually got an influencer to promote one of his products and even shared the exact product that he was basically using which is like crazy [inaudible 15:10-11] will actually do that and he did it in the public workshop with me. In a matter of like an hour he generated over $160 right on the fly during the time that he was actually talking about influencer marketing with my followers. Once we have that video available I’ll let you guys know right away but I do have to tell you, yes influencer is a really quick way for you to get traffic and for you to start getting sales right away. It’s not going to be like ads where you create it and let it run and then you look at data points with influencers. It is more of basically you buy it once, see the data and you have to wait for like a month later and then you can rebuy it so you constantly reaching out to create a network of influencers within your niche that you can constantly go at. It’s kind of like buying solo ads email in a way but instead of sending an email copy they are actually doing a post for your product or whatever you want to promote in your arsenal. Again, I don’t talk about it a lot because I don’t use it as frequent enough for me to actually talk about it but I have one of our brand ambassadors Connor James who does phenomenal results with influencers. I’ll make that video available very, very soon. [0:17:04] Question 4: My question is, how many products in a week should/can I test? I want to find winning products to start with my ecommerce; will it be enough if I test 10 products a week? Or more? Also, when I find the winning product, Can I scale it to make 6 figure profit? I've heard people say you can make up One (1) Million dollars profit from ecommerce, is this possible and realistic from one product? Or how many products will I need for this? Also, I want to set the Ad on $5/day for testing, is that too small? Will it give me results quick and fast? My question is, how many products in a week should/can I test? I want to find winning products to start with my ecommerce; will it be enough if I test 10 products a week? Or more? Also, when I find the winning product, Can I scale it to make 6 figure profit? I’ve heard people say you can make up One (1) Million dollars profit from ecommerce, is this possible and realistic from one product? Or how many products will I need for this? Also, I want to set the Ad on $5/day for testing, is that too small? Will it give me results quick and fast? You have a lot of questions. Let me drill down one by one to make sure that everyone is on the same page and for you to understand this properly. So your first question is how many products in a week should/can I test? The truth is test as many as possible but let’s face a real fact you may have a limited and smaller budget. You have to test in a way where you are comfortable on the investment of the [inaudible 18:22] that you are going to spend. If you want to do 10 products a week and if you’re running around 48 hours to 72 hours or let’s say you’re running for three days, $5 per day, if you’re running 10 a week so you’re basically going to spend around 600-700 bucks a month on ads just to test a product. If you are comfortable with that then that’s absolutely fine. Again, the answer to your question is obviously test as much as you can only because you want to find out one winning product as quickly as possible. To your second question, will testing 10 a week be enough? Or more? The same question. Testing as much as possible is the quickest way. I know people who test 10 to 20 products a single day. Again, it’s whatever you are comfortable with when it comes to your budget. For your question, can I scale one winning product to make six figure profit? Six figure profit for one product? Yes, it is very, very possible. You only need one product to make six figures with your store. Profit-wise, yes. I’ve seen multiple and even myself I have one product that can produce me over six figures in a single year. One of them is nearing $500,000. However, your question is I’ve heard people say you can make up One (1) Million dollars in profit for that one single product. Yes you can but it is very, very hard. You need to actually have a product that is unique, that is different, that can’t be find anywhere else then it will give you a chance to actually have $1 million in profit. When it comes to profit and sales, numbers are very different. In the ecommerce world, an average around 20 to 30% net profit margin. In order for you to actually really make a million dollar net for that one product, you need to basically sell around $3 million worth of products. Let’s say if it’s $3 million worth of products and you’re selling the product let’s say for $20 you need to make 150,000 orders in a single year to make that $3 million. Now, is it possible? Absolutely! Is it going to be easy? No way! I’m just going to be honest. no way it’s going to be easy for one single product to actually make $1 million unless like I said your product is unique, is not found anywhere may have a patent or all those other stuff. It’s kind of like when the fidget spinners came out, those made a heck a lot of money and they were hit, they were in style, they were trending right then and they made a lot of money. Again, since the product is so easy to replicate, guess what? Everyone starts diving into it and the market crashed because of that. I’m just being really honest and being realistic with you about that end of things. How many products will I need for this? If you really want to make $1 million net profit then you basically have to identify the following. You have to reverse engineer the Math. So let’s reverse engineer it together. Again, let’s say that you have to make around $3 million sales for $1 million if you have all the data points right. Let’s say that your product is going to be around $20. That means that you need to make 150,000 orders in a single year. If you divide that by 30 days in a single month you basically need 5,000 orders in a single day. 5,000 orders for one product, to be honest, it’s a little bit hard but if you say 500 it’s very attainable. Let’s say that a product is going to be 500, so if you divide it by 500 sales a day for one single product you basically get 10. If you want to make $1 million net of a $20 product and have all the data points right and achieve 500 orders per product then you should have around 10 products if you want to hit that number. Your last question is I want to set the ad on $5/day for testing, is that too small? Will it give me results quick and fast? There are two ways that you can do it. $5 a day is basically slow and steady to figure it out and you’re working with a limited budget. If you have a budget and you want data points fast and make a decision between 24 hours or 48 hours to if the product sells or not, I would actually encourage you to do $20 a day ad set because obviously the more budget you have the quicker the system will run, the faster you’ll get the results. Again, it really depends on the budget and your comfort level to distinguish what it is. With $5 you’d still get good data points but with $20 you’ll just get quicker and faster data points for you to figure out if that product is going to sell or not. I hope that helped you out. Put in a ME into the comment box of Facebook and YouTube if these are helping you out, like me answering all these questions and are really opening things up for you to basically understand from my perspective what I would do if I were in your position. I am just sharing my knowledge with every single one of you. Awesome! I’m getting a lot of ME’s coming in right now. [0:24:33] Question 5: Can you please talk about custom conversions created with apps like Trackify? I just installed it and I´m a bit confused, it would be very helpful if you could talk about this key element to improve our targeting and our pixel! Moving forward to the last question of the day. It’s by Felipe Vergara. Hi Fred! Can you please talk about custom conversions created with apps like Trackify? I just installed it and I´m a bit confused, it would be very helpful if you could talk about this key element to improve our targeting and our pixel! The answer to your question is I do not use Trackify. I have an app called which I own called pixel bay that basically do the same thing if not better. 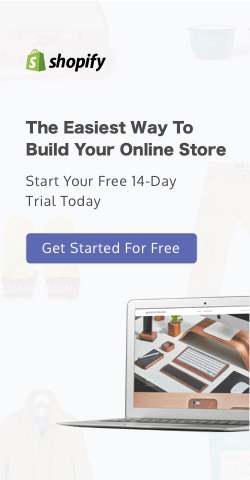 What you need to understand is that when you are advertising a store inside your Shopify store, you have a lot of products that you are selling, you may have a general store and that each product attracts a different customer data base or different prospect to go to your store. If you basically set up the traditional way on just going after the entire website conversion based on purchase then when a person who wants to by a bracelet and a second person who wants to buy a watch; the behavior of the people who buy this versus this is very different. If you don’t separate it out with custom conversions using apps like pixel bay which I own then you are going to basically confuse the Facebook pixel because Facebook is going to combine these two audience together and find people who are going to be all over the place and they’re not really tailored toward buying that one product that you have set up the campaign for. I know that this sounds a little bit over your head but what I want you to do is if you are on YouTube go into my channel and search up for Facebook pixel. I remember it was in one of my Ask Fred Lam shows that I used to have, I did do an entire video training and I even drew out a map and everything to explain what it is. I don’t remember on top of my head which episode it was but look into it there was something about turbo charging your Facebook pixel or simply search for Fred Lam or turbo charge your Facebook pixel. It’s like an hour long that I explained the entire process of why you need to actually set up a custom conversion for your Facebook pixel and why you need to use app like pixel bay. When you watch that video you will basically understand it and it will be much easier than me just talking out loud because it’s more of a visual thing that you want to actually watch. That is it for our daily huddle today. I hope that you guys actually learned a bunch of new things. Quando said, “It is actually Ask Fred Lam weekly show episode number 12.” Thank you for sharing that. It’s episode number 12 that talks about the custom purchase conversion and everything. If you’re watching the replay of this please comment below on YouTube and on Facebook to share with me what your feedback are on my daily huddle for today. If you are on YouTube please subscribe to my channel and if you are on Facebook please like me and follow me so that each time I come online you get instant notifications so that you guys can be here live with me and I can see all your names. I got a lot of people from all over the world to be here with us for our daily huddle. And if you want your question to be featured in our daily huddle make sure you go to www.fredlam.com/ask fill in that form and I will get your question featured as soon as possible. Again, right below leave down comment, tell me what you guys think about our daily huddle today and please share this to a friend or family member who are trying to build an online business because I’m certain that this information will help them out. That’s it for today guys, I’ll see you tomorrow and I’m planning to come online probably at around 7PM Eastern time or 4PM Pacific. Other than that I look forward on seeing you guys tomorrow. Bye now.